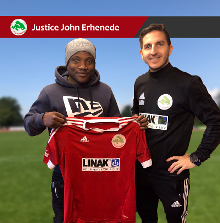 Danish club FC Sønderborg have announced via their official website the signing of experienced Nigerian striker Justice John Erhenede. The FC Ebedei product had been searching for a new employer since his departure from Kolding IF in July 2016. In his first words as a Sønderborg player, Erhenede said to the official website of the fourth-tier club : ''I'm really happy to get back and have been taken really well by the club and the team. ''I am motivated and look forward to becoming part of the team and especially Sønderborg. I hope to help lift FC Sønderborg to the next level. " Head coach Gunnar Guillermo Nielsen added : ''Justice can contribute a lot on and off the track with his experience from former top clubs, in addition he is a fresh breath socially. The 31-year-old Erhenede previously wore the jerseys of Danish clubs FC Midtjylland, Vejle BK, Hobro IK and HB Köge, he arrived in the country fourteen years ago.